Planning to move? While packing and moving household stuff and belonging is a cumbersome task, moving heavy yet delicate furniture pieces like pool tables and pianos can make it all the more tough and tricky. Pool tables are indeed heavy. With a standard sized pool table weighing in excess of 350 kg, proper planning, and coordination goes into undertaking and executing such a move. To be honest, it’s not about physical strength but careful pre-planning and meticulous execution that will result in an effective pool table removal. 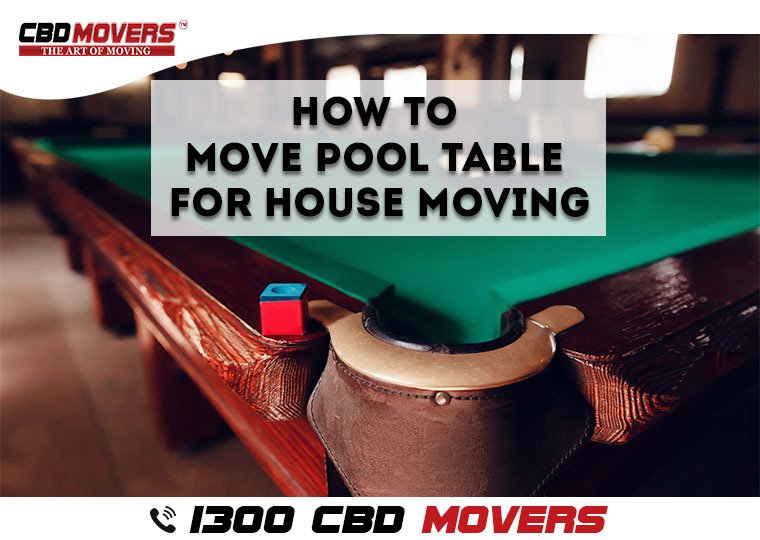 Mentioned below are a few handy tips which will help you get ready to move your pool table for an effective house moving and furniture removal. • Measure: Measure the size of the pool table and cross check it with all doorways and driveway through which it will pass before it is loaded onto the truck. Ensure that no fixed fixtures like doors and walls interfere. • Dismantle: Unless of course the shift requires only dragging, you cannot move a pool table without dismantling it. Dismantle it carefully, detaching the legs and the top slate. Place them carefully to avoid slip and fall. • Pack it deftly: To avoid scratches and dents, cover it properly with bubble wraps and protective sheets. Also, use soft floor protectors to safeguard your flooring from dragging marks. • Check the floors: In-case you need to move the pool table down the stairs, go in for special ramps which aid in moving a pool table smoothly over the stairs. • Get the required gear: You definitely cannot pick and move the pool table. Arrange for trucks with hydraulic lifts and pedals. Restraining straps will help cut movement and jerks during transit. Moving a pool table is certainly not a DIY task. Planning to move it without professional support will lead to damages beyond repair. Thus, hiring best interstate removalists in Brisbane is a prudent choice. At CBD Movers, we are the expert interstate removalists in Brisbane. Our effective removal tools and techniques and unmatched removal strategies allow us to seamlessly handle your interstate move with ease. Operating across Brisbane and its suburbs, our furniture movers are renowned for superiority, skill, and strength.